Tee it up for Fantasy Golf! The PGA tour season is now a week old and the tour moves to Las Vegas for the second stop. These early season events have something of a strange feel to them being so soon after the end of the previous one. However they do prove useful in taking a first look at the tour newcomers and seeing how they’ll cope on the PGA tour. Now is a great time to play fantasy golf at DraftKings. Tons of fantasy football players are trying out golf and the tournaments are fun. 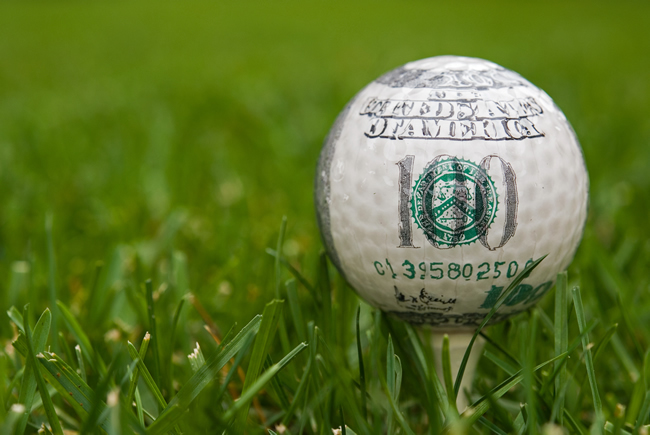 Get into this weeks $2 PGA Chip-Shot. It is the most fun you can have for $2 dollars! DraftKings is legit and legal for US players in all but a few states. The big news this week is that Billy Horschel is playing. It’s probably safe to say that at the end of the season Horschel was the best golfer on the planet, so this week will be interesting to see if he can carry this on. Webb Simpson and Jimmy Walker also both play, as well as Brandt Snedeker and Vijay Singh. The tournament is played at TPC Summerlin which plays to 7,255 yards. The course is situated in the Nevada desert and was opened in 1991. The course has a par of 72 when members play, but has a par of 71 when the PGA tour pros hit the fairways. Last year Webb Simpson won the event in dominant fashion, his highest score of the week being 67 and winning by six strokes from both Ryo Ishikawa and Jason Bohn. In 2012 Ryan Moore won the title by just a single shot from Brendon de Jonge after starting the week with a 61. Jonas Blixt of Sweden finished 3rd. Other notable winners of the tournament include Tiger Woods, Davis Love III, Paul Azinger, Greg Norman and Jim Furyk. Hideki Matsuyama – Matsuyama is a player who is slowly but surely rising to the top of the game, achieving his first win on the PGA tour this year at the Memorial tournament in June. Last week he finished 3rd in the Frys.com Open to open the season well and will expect another good performance in the second week of the season. Webb Simpson – Webb Simpson returns to TPC Summerlin as defending champion after dominating the event last year. Simpson is a player who has been somewhat disappointing since his US Open win in 2012, not reaching those heights again, however there are signs his game is there, as evidenced by three top 10 finishes in his last nine outings on the PGA tour. Brooks Koepka – Koepka could be said to be the most consistent player in the field this week. His last four events has seen him finish 3rd, 11th, 9th and 8th, three of these on the European tour, the final one last week on the PGA tour. Koepka is a player who is steadily rising in the world rankings and has reached a career high of 64th. Ryo Ishikawa – Ishikawa finished runner up at this event last year with four solid rounds of 67, 66, 68 and 65 so obviously feels at home playing the course. His current form is OK, with 15th and 36th place finishes on the Japanese tour followed by a top twenty finish last week in the US. Sang Moon Bae – This is a player who finished last season on the tour pretty miserably with five missed cuts in his last eight events. Last week he sprung something of a surprise with a two shot victory at the Frys.com Open and is the early leader in the Fedex Cup standings. This is the second year in a row he has won on the PGA tour, so he can clearly get the job done on a Sunday. This pick is something of a gamble however – last time he won on the PGA tour saw the start of a miserable run. Sang Moon Bae could be very good or very bad this week! He is a gamble, but gambles sometimes pay off. Camillo Villegas – Back in 2008 Villegas was a top ten player in the world and great things were expected of him. However his game went backwards and as recently as March was 281st in the world rankings. His form improved slightly and saw him climb slowly back up and a win at the Wyndham championships was a welcome return to the winners circle. Last time out Villegas finished 20th in the BMW Championship and this year could see a return to the big time for the popular Colombian. Tony Finau – Sleeper – Finau is another player who is consistent week in, week out, with just one missed cut in his last twenty outings. His last eight events have seen six top twenty finishes including a win. Admittedly, many of these performances have been on the Web.com tour, but he impressed last week by finishing 12th on his PGA tour debut, and I can see more big things this week for the 25 year old American. Colt Knost – Sleeper – Knost is another player on a great run of form, finishing 4th, 2nd, 8th and 14th in his last four events of the Web.com tour last year. This earned him a return to the PGA tour where he finished a solid 26th last week and I see Knost as a good value pick this week. Note: Billy Horschel obviously came into my considerations this week, but he is a very obvious pick on form and I envisage him being a pick for a good majority of players. As such, I think the value lies elsewhere this week. The early betting lines see Billy Horschel leading the way with Hideki Matsuyama, Brooks Kopeka, Jimmy Walker and Webb Simpson in a group behind. Other players seen in contention include Graham Delaet, Martin Laird and Ryan Moore. Win $1,000,000 with a $27 entry playing fantasy football.